The label is readable but as you can see from the photo this is a small section missing. 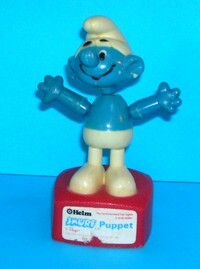 Figure works well but there is paint on the Smurf's face and the "white" is slightly yellowing. Slight glue residue along seams of his hat - this is normal in plastic push puppets of this era. Label reads - Copyright Helm - Recommended for ages 3 and older. Smurf Puppet - Peyo - Licensed by Wallace Berrie & Co Inc, Van Nuys, CA. On the button in the base it is stamped - British Patent - Made in Hong Kong.